Samsung Galaxy Note 4 is about to launch in the United States this week, so we managed to spend quality time with an AT&T version of the flagship phablet. The SM-N910A will officially hit the carrier’s shelves this coming Friday, on October 17. Under the hood, the Samsung Galaxy Note 4 packs the same specs as the international version we reviewed extensively. Highlights include a Qualcomm Snapdragon 805 SoC, 3GB of RAM, 32GB of expandable memory, 5.7” QHD display, and 16MP ISOCELL camera with OIS. The retail package of the Samsung Galaxy Note 4 for AT&T is rather basic. The carrier-branded box features the phone, an adaptive fast charger with USB cable, a few booklets, and several S Pen replacement tips. The absence of a stereo headset in the box is rather surprising. Considering the device’s flagship status and $800+ price, headphones should have been bundled with the phone. 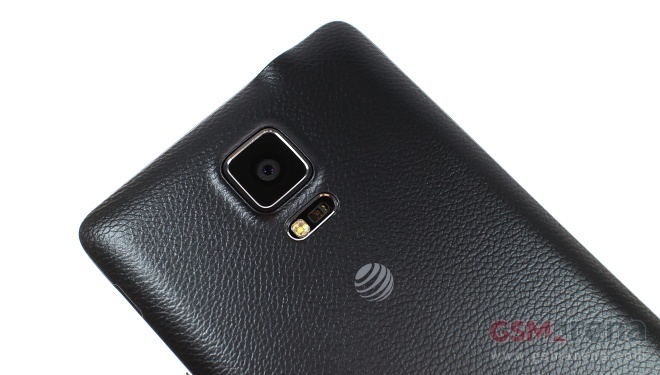 Visually, the Samsung Galaxy Note 4 for AT&T differs from its international sibling by the branding on its back cover. The carrier version sports both an AT&T globe and Samsung Galaxy Note 4 livery, whereas the SM-N910F only has Samsung logo on its back. Software-wise, the Galaxy Note 4 for AT&T boots Android 4.4.4 KitKat out of the box. There are no differences in the overall experience from the model we reviewed. Carrier bloatware, while rather extensive, is easy to remove. AT&T deserves a hat tip for giving users the option to do so. Samsung Galaxy Note 4 is bound to be a top choice for a high-end smartphone, despite the increasingly competitive smartphone market in the United States. The fourth generation of the Korean giant’s phablet blends beefy hardware and software features that will appeal to both casual and power users. It is therefore easy to recommend to anyone on the market for a top shelf smartphone at the moment.